Through South Carolina’s low country, the Swamp Fox Passage zigzags a 42-mile route across the vast Francis Marion National Forest. 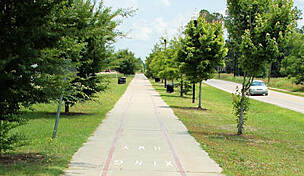 From Awendaw, near Bulls Bay on the Atlantic Coast, inland to Lake Moultrie, this passage is the longest section of the cross-state Palmetto Trail. 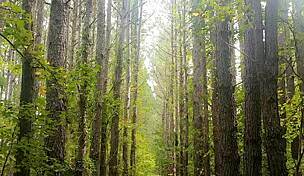 It traverses four distinct ecosystems, including swampy wetlands, grassy savannas, and coastal pine forests. As you can imagine, this diversity allows for an abundance of wildlife, vegetation and scenic vistas. 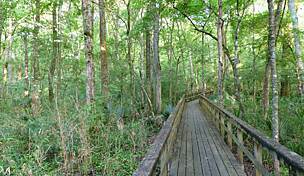 Highlights of the trail include the grasslands near Dog Swamp and Turkey Creek and the Wadboo Swamp, one of the numerous swamps in the region where the trails’ namesake, General Francis Marion, found refuge from the British troops during the Revolutionary War (thus earning Marion the nickname “Swamp Fox”). The Swamp Fox Passage (SFP) is partially built on the rail bed of logging trains that were once scattered throughout the region and today the elevated railways allow for easy passage through wetlands. The SFP surface is primarily dirt and grass with numerous boardwalks and bridges. The trail can be rough and bumpy from tree roots popping up, so don’t expect to travel at a fast pace. Cyclists may want to consider fat tires and dual suspension and certainly have a tire repair kit on-hand. There are several access points and five primitive camping sites along the route, making it easy to enjoy the SFP as one long trek or in shorter day trips. 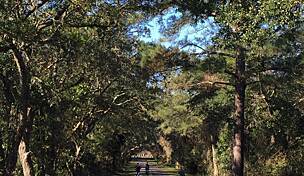 You can continue on the Palmetto Trail from both ends of the SFP, continuing to the coast via the Awendaw Passage and around the lake via the Lake Moultrie Passage. Our itinerary proposes a two-day, one-way ride beginning from the eastern trail terminus in Awendaw. Arrange a shuttle pick-up at the western trailhead and bring camping and food supplies for the entire two days. There is potable water available at a ranger’s station roughly half-way through the trip. During temperate months, be ready for biting insects and warm temperatures. 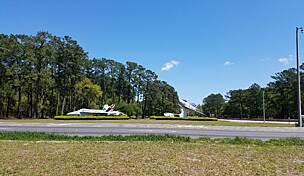 The closest airport is Charleston International Airport, 55 miles south of Awendaw. Overnight accommodations can be found in Charleston or closer to the eastern trailhead in Mt. Pleasant and Isle of Palms. There are several bed and breakfasts in Mt. 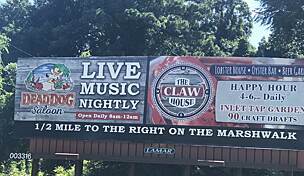 Pleasant, including Plantation Oaks Inn and The Inn at I’On, as well as a handful of chain hotels such as Hampton Inn & Suites and Residence Inn. Alternatively, you may want to head to the beach. Isle of Palms is known for its seaside resorts and oceanfront hotels, including Wild Dunes Resort and Seaside Inn. Awendaw is a small town but there is much to the surrounding area that is worth exploring before or after you cycle the Swamp Fox Passage. 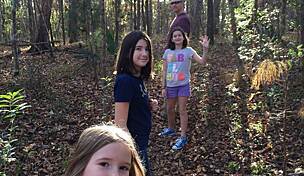 The Sewee Visitor and Environmental Education Center is an excellent place to start. You will be introduced to Cape Romain National Wildlife Refuge, 66,287 acres along the Atlantic Coast that was originally established as a migratory bird refuge but now also assists in the recovery of threatened Loggerhead sea turtles. You can also get information and directions to the Sewee Shell Mound, a pre-Columbian Native American historical site of shell rings believed to be discarded oyster shells. 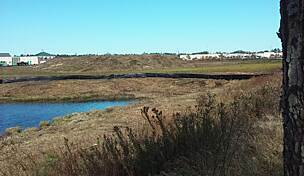 A 120-foot boardwalk and self-guided interpretive trail overlooks this site. But it doesn’t end there. You are just a ferry-ride away from Bull Island, the largest of four barrier islands with the Cape Romain NWR, where one could easily spend hours beach-combing, birding, hiking, and looking for interesting critters. Boating is another popular recreational activity and Nature Adventures Outfitters can set you up with kayak, canoe, or paddleboard rentals; they also offer guided tours. You might enjoy timing your trip to coincide with the annual Bulls Bay Nature Festival or the traditional Blue Crab Festival (but come with an empty stomach for this one and be prepared to eat steamed crabs by the bucket). Get all your food and needed supplies for the trail ride before you come to town; Awendaw is not overly steeped in services and shops, though you will definitely want to make time for a meal at SeeWee Restaurant, known for its southern-style seafood and casual but delicious fare, located south of the visitors center. Park at the trailhead off of US 17 just past Steed Creek Road. You begin the SFP already well-immersed within the eastern edge of the Marion National Forest and shortly encounter the first of many creek and forest road crossings to come. At Willow Hall Road (mile 3), there is an additional trail parking area. The first primitive camping area is 5.5 miles from the trailhead at the juncture of Steed Creek and Halfway Creek Roads (there is parking and water here as well). Pine and oak forests surround this campground; remember when camping, set-up only in designated areas and do not cut live trees for firewood. 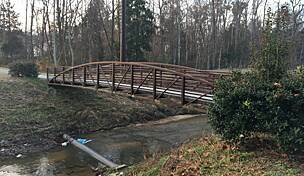 You are riding on a former railroad right-of-way, constructed during the mid-1920s and owned by the A.C. Tuxbury Lumber Company (est. 1905 in Charleston). South Carolina was at one point home to hundreds of logging operations scattered from the eastern coastal plains to the western mountains and privately-operated logging railroads steadily moved the fine virgin timber of the coastal swamps. It was a relatively short boom, however, and by the 1930s timber tracts were exhausted and logging operations suspended, though in A.C. Tuxbury’s 30 years of operation, the company cut some 715 million board feet of lumber making it one of the most extensive such operations along the East Coast. Over the course of the next two days, you’ll have plenty of time to appreciate the immensity of the forest lands and the incredible effort of creating a 500-mile cross-state trail, of which the SFP is one of 26 passages. Birders will want to be on the look-out for the endangered red-cockaded woodpecker which lives in the region’s mature long-leaf pine forests. Songbirds, waterfowl, and wild turkey also populate the trail’s surrounds. From Halfway Creek campground, the SFP parallels (though doesn’t hug) Halfway Creek Road. You ride south for several miles to finally cross the road and pass by Harleston Dam campground on a northwesterly trajectory. A bridge takes you over Harleston Dam Creek at mile 10 then crosses Steed Creek Road again three miles later to enter the grassland terrain of Dog Swamp. Longleaf woods gradually give way to beech forests as you meander northward toward Turkey Creek; from here you’ll loosely follow the creek west for several miles before turning north again. 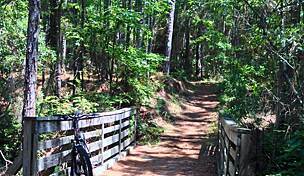 At mile 25 is Nicholson Creek Primitive Camp, a good place to get off the bike and call it a day. Today’s segment of the SFP meanders through wetter country than yesterday’s terrain. The first five miles beyond Nicholson Creek are in the shape of an inverted “V,” taking you north for a mile before turning around to parallel Witherbee Road south a few miles to the Witherbee Ranger Station. Though the day is young, you’ll likely appreciate the only rest area along the SFP, with its picnic tables, water spigots, and an information kiosk with trail details. Shady oaks surround Witherbee Primitive Camp, less than a mile farther. The SFP passes under the southern edge of Little Hellhole Reserve, a dammed waterfowl area. Beyond that is Alligator Creek and Cane Gully which the trail crosses on a long dike and bridge. A footbridge takes you over the small Callum Branch and just over a mile later you arrive to what could be the highlight of today’s journey, Wadboo Swamp. Look for the saw palmetto in the woods on your way there. A bridge spans the swamp stream providing you with a chance to observe the amazing life within this wet bottomland woods, once used for rice-cultivation. Dipping in and out of swamp wetlands may give you pause to consider how Independence War hero, Francis Marion, might have used cunning and elusive guerilla tactics to surprise British regiments after they captured Charleston. It is said that Marion earned his nickname in 1780 when a British Lieutenant, informed of Marion’s whereabouts by an escaped prisoner, chased Marion and his men for 26 miles, only giving up when Marion escaped into a swamp. Let’s hope your escapade through the swamp is more peaceful than his surely was. The SFP enters longleaf wiregrass woods and crosses US 17A. From here, you are less than 3 miles from the trail terminus. 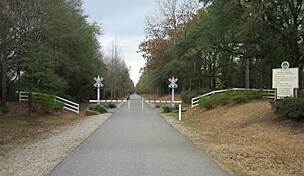 Surrounded by oak, sweetgum, and bay trees, the trail passes under a power line and finally crosses US Highway 52 signaling your arrival to the Canal Recreation Area, where there is parking, water, a campground, and access to the Lake Moultrie Passage trail. 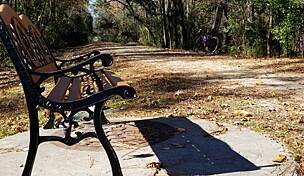 The town of Bonneau sits on the western edge of the Francis Marion National Forest. Two miles north of the SFP trailhead, it is smaller than Awendaw and offers little in the way of services.